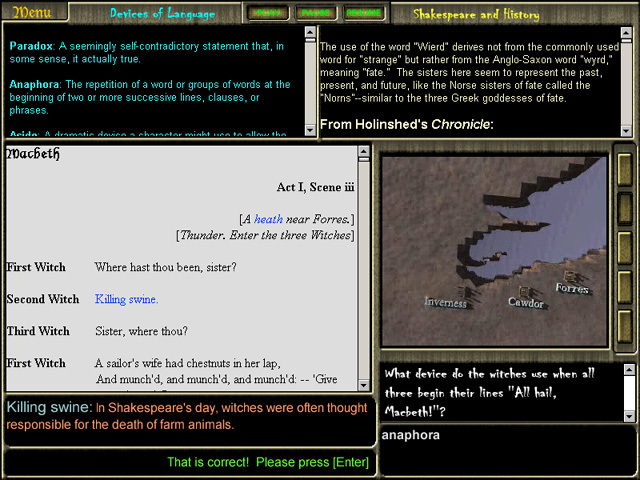 Here is a computer program for an intense study of Macbeth, uncovering the entire play scene by scene. Your students will study from and answer questions on Shakespeare's original sources, the geography of Scotland appertaining to the play, the works of art inspired by Macbeth, and the language devices masterfully used in this darkest of Shakespeare's dramatic works. This program contains complete score reports, maps, text glossaries and more. Qweas is providing links to Macbeth Software 1.2 as a courtesy, and makes no representations regarding Macbeth Software or any other applications or any information related thereto. Any questions, complaints or claims regarding this application Macbeth Software 1.2 must be directed to the appropriate software vendor. You may click the publisher link of Macbeth Software on the top of this page to get more details about the vendor.